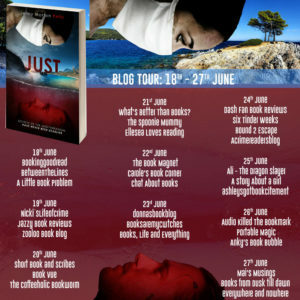 I’m taking part in the blog tour for Just by Jenny Morton Potts today and have a fabulous guest post by Jenny to share with you along with a chance to win a copy of Just. I’d like to thank Rachel Gilbey from Rachel’s Random Resources for the place on the tour. Well, is it? Is it important where to set your novels? Of course it is, mostly. Even if we were to say that an author worth his salt could set a book inside a closet, with no light, and still make it fascinating, that closet is still a very important setting; vital. Some novels come absolutely from the setting. Landscapes and seascapes, even moonscapes or Mars-scapes. That is to say, the novel could not be set elsewhere and work with the text. But equally, many novels are about their ‘what’ rather than their ‘where’ and then the author gets to pick the setting; to have a good old mull around the atlas. That can be a lot of fun, that freedom. But it’s a good feeling too when there is no choice; when the ground has grounded you. A firm anchor brings confidence, when you know for sure where you want your characters to prowl. And in a practical sense, having no choice cuts down on planning, on thinking time. If you know the land of your story well yourself and have perhaps lived upon it, well, even better. In my latest novel, Just, I had dual settings, as is my wont. 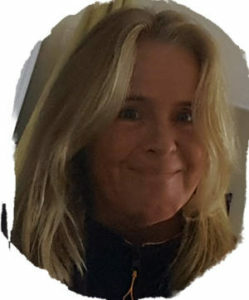 I like, for thriller and indeed for any genre, to have a British location and a foreign one. I’ve never sat down to make this decision, it’s there before I even begin. And I’ve never analysed this, till now. So Short Book and Scribes asks the question and I am obliged to have a mental rummage. I don’t really like rummaging in what I perceive to be my own mind. Though I rummage like crazy in everyone else’s. I particularly shy away from analyses involving very natural, effortless decisions, like choosing setting. So that’s awkward. Why do I shy away? Well, I don’t really want to examine things that work. If it ain’t broke, etc. I don’t want to hex myself, do I? Why don’t I just tell you why I picked the settings for my new novel. Alright then, agreed. The Langbrook family in Just live in Cambridge, and more precisely, Grantchester (yes, where they film that show). I am in Cambridge every Saturday to deliver my son to art lesson and then drama, so me and the dog have a lot of time, most of which is spent in Granchester, walking, typing in the car, listening to Grill Graham on the Radio. (I would love to be an Agony Aunt.) Grantchester is an ideal novel location as it is famous for the tv show and for being home to Rupert Brooke. Jeffrey Archer lives in Brooke’s house now. I fantasise about putting Just through his letterbox. And of course there are the super famous Orchard Tea Rooms where Virginia Woolf and pals hung out. And then too, Lord Byron used to swim in the river at Granchester and has a Pool named after him. So it was a no-brainer really. The other family are the Maziqs who come from Libya, where sadly I have never been. Brits now know Libya for all the wrong reasons but it is a stunning country full of resources and potential. I also took Fiyori Maziq to Puglia in Italy which I know well and love. My two main protagonists, doctors Scott and Fiyori, are from very different backgrounds. He grows up in the idyllic English village described above and she in an orphanage in the Middle East. He lived in a mullion windowed, wisteria clad house, with peace all around and she took part in sea festivals among hot sands and violence. That’s what I want, plenty of juxtaposition. There are some very tough scenes in Just, as the doctors work to care for the living and the dead, but also funny and joyful ones. 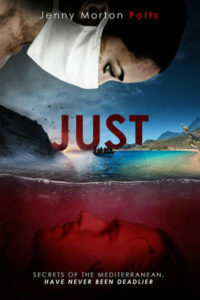 I have tried to avoid any sensationalism during the more harrowing parts but had to portray the reality. The disparate settings are reflected in the vast range of emotion. We witness fury, trauma, immense sorrow but we also get humour, fulfilment and sheer delight. Here are some of my favourite books, with memorable settings: The Shipping News by E Annie Proulx, The Bone People by Keri Hulme, Cancer Ward by Alexander Solzhenitsyn, A Thousand Acres by Jane Smiley.